You can now run 2 whatsapp in 1 android phone using parallel space multi accounts app. As of today, Whatsapp 2.16.55 is the latest whatsapp version available.Whatsapp 4.0 version claims to have several amazing features. They include sending more than 10 pics in whatsapp at a time, Delete Wapp messages on both sides, theme and sticker support like hike messenger. 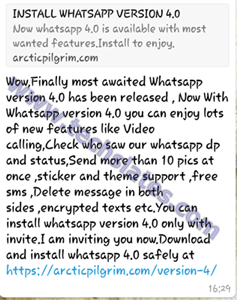 Not yet released Whatsapp video calling app version is being scammed as arctic pilgrim com version 4 wApp version. Techslates Team recommend not to click on Wapp group broadcasted messages about Whatsapp version 4.0 download. The scam message will appear to like as below. If you are facing problems with Whatsapp crashes, upgrade to the latest version. You can also check out how to use whatsapp web version. Never share such kind of scam to your friends, it will raise the fraudster’s third-party software(arcticpilgrim) scam. Always update the Whatsapp version through official site. You can now install two whatsapp on single dual sim phone.Try it out. Need Dps for your Whatsapp groups.Download the latest Whatsapp group DPs. 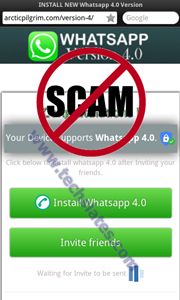 Please share this article to your friends to help your friends.We once again says that the official whatsapp version 4.0 download is not available.The scam is related to arctic pilgrim com version 4.0 website.Never try to download whatsapp updates from fake sites or messages.This download arctic pilgrrim Whatsapp version 4 scam is spreading rapidly.Be Alert and inform your whatsapp friends.